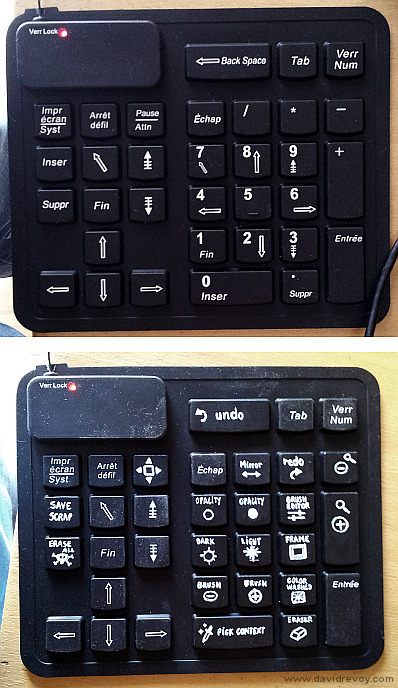 While doing shopping today I found in a discount supermarket a flexible numpad sold only 2.79€ . Cheap enough to do test and add it to my basket. 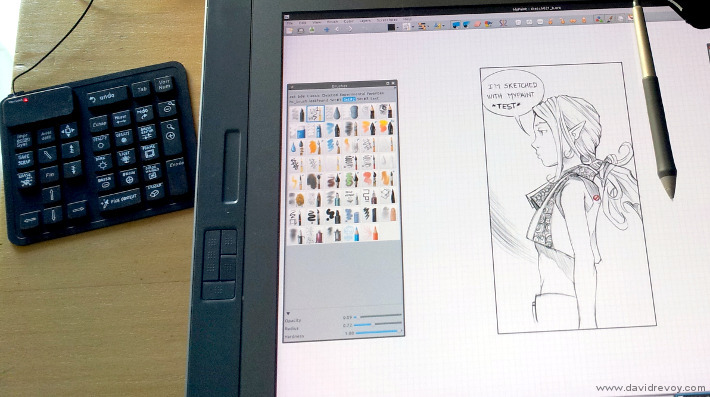 It's work plug and play in 12.04, and so I decided to customise it a bit to transform it as shortcut pad next to my Cintiq. I tested in Mypaint the key I could attribute as shortcut, then painted all those configurable slot with black acrylic to erase the symbols . The new white symbols were painted with a white decorative pen, acrylic based too. Only one hour was suffisent to do it, and for sure, after a little sketch, this pad is way better than my old Gamepad hack . Image : the top one is the aspect right out of the box , and bottom is my final customisation ( sorry for the dusty aspect, the sun angle and auto sharpening of my camera were not friendly for this picture ) . Much cleaner, I quite like it. I would use my little NES controller as is though— D-pad for moving about the canvas, A for zoom in, B for zoom out, and START and SELECT for color and brushes! Was it difficult to configure it to work with mypaint? @mrspacklecrisp : Oh oh , a Nes controller have the extra "icing on the cake" for the decorative aspect. Sound a cool mod. @Chris Williams : Setting shortcut in Mypaint is really easy. Just go to the 'Mypaint' menu , and with mouse over menu items just press the shortcut you want. It's the easiest method of the world ! The setup took me less than a minute. The cons are ; it maps also your "real keyboard" shortcut to the numpad layout. As my Cintiq is in rare use, and connected to my laptop, I use exclusively Mypaint on it ( other softwares lag too much ). I also very like the default shortcut of Mypaint, they are really smartly made. It is so small, a elite keyboard for 7 inch tablet and provides you a full of buttons and take a small space in front of your cintiq. @Googiga : hey thanks for sharing ! this device looks really good. There is no bug with your graphic table? I just put it up; crude, but still useful. Much of it done with xpaint which was nice cause I could import so many different graphics formats. But when I looked at the Linux drafting software, it looks like they only want a few proprietary file formats. I'd never try something like this but there's so much online that can be cut & pasted up to make something useful. I'm not an artist, but took drafting in college and have worked in machine shops so I know what that talent needs to work with. No, there is no software I know able to turn a model-sheet into 3D automatically. Blender is the right tool to do it manually ; and there is a lot of tutorial about how to add to the viewport the front/rear/back view to use as guide and reference for the 3D modeling. A tablet would not help. For this type of graphic , ( shape/curves/etc...) maybe Inkscape is a better tool. Wow. That's so cool! Thank you for sharing the link.